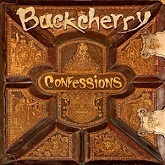 Review: "Buckcherry: Confessions" - Sea of Tranquility - The Web Destination for Progressive Music! Buckcherry have long been a band which I could take or leave � to be honest, it's mostly been leave. Confessions has changed all that. They've finally made an album which I can really get my teeth into and about time too! Perhaps it's because they're now with Century Media (very odd bedfellows I'd have thought) and have nowhere else to go to get product released but Buckcherry have produced their best ever set of songs. Just for once, Confessions even finds me warming to vocalist Josh Todd. Interestingly, and I know you've worked it out from the song titles, the seven deadly sins are up for discussion here, I don't know whether this makes it a concept album but to my mind Confessions is by far the most complete Buckcherry album yet. It is by no means a laugh-a-minute and Mr Todd sounds really weary at times and his voice has become more worn over the years which suits the material well. Some of the lyrics are quite profound and self-searching as in the opening verse of "Pride". Honesty has called my bluff and victory is mine. I'm going down nothing else but bullets in my pride. And I know all this has changed me." Occasionally the gratuitous swearing gets in the way of the grown-up nature of the themes but overall I recommend this one highly.